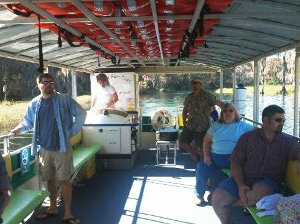 Jon Semmes U.S. Coast Guard Licensed Captain Pontoon Boat Tour Guide in Dunnellon Florida. Jon Semmes, captain and guide at Singing River Tours, was born in Scottsboro, Alabama, in 1968. He and his family lived on the side of a mountain and the Tennessee River was their back yard. Jon describes it thus: "It was a beautiful place of huge rock, giant twisted vines and fresh-flowing streams running down the mountain. The river was like some sort of huge god that, as a child, forever fascinated me. 'Mama, is that river over my head?' 'Can I swim that river?' I asked. It was a great place to grow up." When Jon was 9, they moved to central Florida to a small town called Dunnellon. "My mother has a way of picking the most magic places. What a place to live! The house sits where two beautiful but totally different rivers meet. One wild, black and secret: the Withlacoochee. The other, crystal, bubbly and clear: the Rainbow. The rivers and I have kindred spirits. I find my peace on their banks and in their currents." Jon has extensive experience in boating, and a deep love and respect for the ecology of our great state. This has led him to earn his certification as a U.S. Coast Guard Licensed Operator. Through the course of his life, Jon has spent many enjoyable hours on the Rainbow and Withlacoochee Rivers, and knows the rivers intimately. He has studied the history of Dunnellon, and will willingly share stories of Dunnellon’s Boomtown history. He is familiar with the native wildlife, and will share this knowledge with patrons. Jonâ€™s sister, Stefanie Gramlich, also a USCG certified captain, serves as crew. Jon shares his knowledge of Florida’s ecology through story and song. What sets Singing River Tours apart from other river cruises is Jon’s talent with guitar and voice. As a professional musician and entertainer, Jon has spent many years sharing music and stories with audiences large and small. Through music and narrative, Jon will entertain and educate his patrons about the beauty and history of Florida’s land, people, and creatures. Jon will also share the music of other fine Florida performers, as it relates to the ecology and folklore of Florida. Join us for a fun-filled day, with inspiring music and the beauty of natural Florida. What more could anyone want?